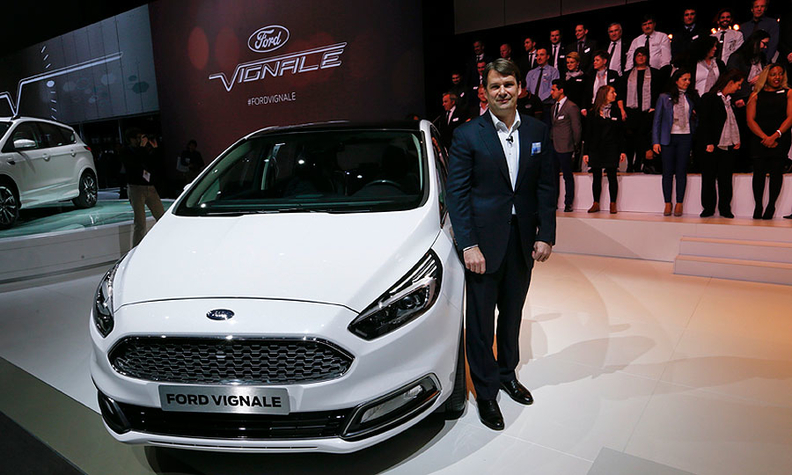 Ford Europe chief Jim Farley with the Ford Vignale in Geneva. Ford has cut its share of dealer self-registered sales in Europe to 4 percent, compared with its overall 8 percent share, he says. GENEVA -- Part of Ford of Europe's rebound to profitability has come from restricting dealers from self-registering cars, commonly known as "punching" cars in the United States. Jim Farley, president of Ford of Europe, said the automaker has tried to minimize two unprofitable sales channels -- dealer self-registered vehicles and sales to rental fleets. Cars that dealers sell to themselves are counted as an automaker's sale, then sold at a discount with minimal mileage as used cars. "It's growing in the U.S., but it is a perfected art in Europe," Farley said in an interview at the auto show here. "In some months in Germany, 20 to 30 percent of the industry is products sold to your own dealers that they register for you as a demo unit and sell as used cars." Ford has cut its share of dealer self-registered sales in Europe to 4 percent, compared with its overall 8 percent share, he said. Partly an outgrowth of lingering European overcapacity, dealer self-registered sales also let premium brands move slow-selling inventory without advertising incentives that might tarnish their image. Farley also has said that Ford is moving to focus on profitable segments such as crossovers and commercial vehicles. He said at a preshow press briefing that Ford will add five crossovers or SUVs to its European product portfolio within five years. He added that in targeting investment, Ford has made "some very uncomfortable decisions" regarding future products. He would not provide details on the cars. One increased emphasis is on performance vehicles, including the Fiesta ST200, a variant powered by a 2.3-liter, inline-four EcoBoost engine with a top speed of 143 mph (230kph). Raj Nair, Ford's executive vice president for product development, said that "right now, the Fiesta ST200 is Europe-only." But Nair also said performance is "a global focus for Ford." He cited such vehicles in the U.S. as the Focus RS, F-150 Raptor, Focus ST "and at the pinnacle, the Ford GT." "They're good business in themselves," Nair said. "But they're great for brand perception and also, the way we're executing them, great for technology transfer."